The parish of Strumpshaw is situated in the Broadland District of Norfolk. It lies east of Surlingham, northwest of Cantley, southwest of Lingwood and Burlingham and southeast of Brundall. The name Strumpshaw may derive from the Old English meaning ‘stump grove’ which could refer to a small wood. The parish has a long history and was established by the time of the Norman Conquest. Its population, land ownership and productive resources were detailed in the Domesday Book of 1086. This document revealed that after the Conquest Ralph the Constable held the land for the king, and that the parish did indeed possess woodland – as had been suggested by its name. Strumpshaw has been subject to several aerial photographic surveys, and these have proved valuable in identifying prehistoric sites. This work has helped to locate a Neolithic oval barrow (NHER 11721), which is currently the earliest monument on record. In addition, quite a few possible Bronze Age round barrows have been noted from these photographs (e.g. NHER 10277, 11285 and 11721). Several field systems of prehistoric to Roman date (NHER 11720, 49571 and 49572) have also been identified from earthworks and cropmarks, visible from the air. Together this evidence suggests that a thriving community were living in the parish during the prehistoric period, and in particular in the Bronze Age. A collection of prehistoric artefacts has also been recovered from various locations. A possible Mesolithic skull, belonging to an adult male, was recovered from the banks of the Yare (NHER 10240). Several Neolithic flint axeheads (NHER 10272, 10276 and 18001) have been found, as well as other contemporary flint tools, which were discovered in the late 19th/early 20th century (NHER 10273, 10274 and 10275). A single Bronze Age copper alloy axehead (NHER 10238), a characteristic find from the period, has also been discovered in Strumpshaw. Additionally, in 1841-42 a number of ceramic cremation urns were found in the parish and these too could be of Bronze Age date (although there is the possibility they were Saxon). This level of activity continues into the Roman period. Again, aerial photography has proved valuable in identifying possible Roman enclosures (NHER 11720, 11865 and 14422), trackways (NHER 11720, 11862 and 49572), field boundaries (NHER 49571, 49572 and 49574) and roundhouses (NHER 49571 and 49579). Of course many of these features are difficult to date with certainty, but the apparent overlap with the earlier agricultural systems suggests these locations continued to be favourable for human exploitation. In comparison to the numerous sites, rather fewer Roman artefacts have been reported. Along with coins (NHER 12446) and pottery sherds (NHER 10239) are more interesting finds like a copper alloy figurine and finger ring (both NHER 39572). There is little evidence of Saxon activity in the parish. 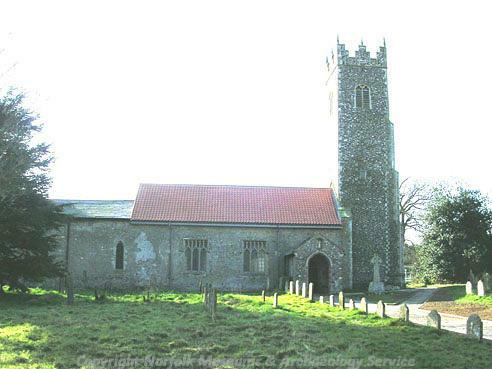 It is possible that St Nicholas’ Church in Buckenham (NHER 10280) has Late Saxon origins, but otherwise no other Saxon sites or monuments have been identified. The only Saxon finds on record comprise Late Saxon pottery sherds (NHER 10280) and a strap end (NHER 40907). There are three medieval churches in the modern civil parish: St Peter’s (NHER 10267) and St Mary’s (NHER 10288) in Strumpshaw and St Nicholas’ (NHER 10280) in Buckenham. St Peter's Church is largely Early English in style with a particularly fine chancel and contains a beautifully carved rood screen inside. St Mary’s dates to the 12th to 15th century but was re-ordered and re-furnished after a fire in 1971. Visitors should take note of the octagonal font, which has been re-cut and has an ornate crocketted cover. As mentioned earlier, St Nicholas’ Church has Saxo-Norman origins, with later 13th to 15th century additions. The interior is very fine and has a quite rare Gothick assemblage of the 1820-1840s. During the medieval period the village of Catton (NHER 23996), which was mentioned in the Domesday Book, supposedly existed in the parish of Strumpshaw. The exact location is uncertain, although it has been suggested that the former village lies somewhere between the railway line and river. We can be more certain that the medieval inhabitants of the parish were utilising the rich resources of the Broads. Medieval peat cuttings have been recorded along Strumpshaw Broad (NHER 13523) as well as along Buckenham and Hassingham Broads (both NHER 13526). Evidence for medieval to post medieval peat or turf cutting has also been reported in the area around Strumpshaw Common (NHER 49595 and 49594). Similarly extractive pits used to obtain peat or clay have been located in Strumpshaw Wood (NHER 40184) and Buckenham Wood (NHER 40185), and these may also have been in operation during the medieval period. Cropmarks of possible medieval field boundaries (NHER 11863), drainage ditches (NHER 16729) and enclosures (NHER 14422) also show that farming was also widespread at this time. Most of the medieval objects are rather mundane, and include pottery sherds (NHER 10278, 12446 and 19798), a jetton (NHER 35019), coins (NHER 37670 and 39572) and pieces of everyday metalwork (NHER 39572). The best finds comprise a Papal bulla and a horse-harness pendant mount (both NHER 40908). 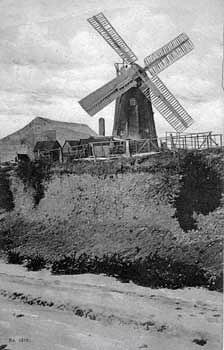 Strumpshaw Windmill, before it was demolished in 1916. By the post medieval era, the lands of Strumpshaw were being drained to create more farmland and living space. Strumpshaw Pump (NHER 10261) was in operation by the end of the 19th century, and used steam engines before converting to oil-powered ones. The pumping station still survives but has been run with an electric motor since the 1940s. Another much earlier drainage pump is show on Faden’s map of 1797 (NHER 10355). The so-called Buckenham Mill (NHER 10356) is another such drainage windmill; the derelict brick tower of this mill survives to accompany the modern pump house adjacent to it. The last windmill worth a mention is Strumpshaw Windmill (NHER 13237), which stood on the highest land in the parish before it ceased operating in 1908, and was demolished in 1916. Of course, a number of the fine buildings in the parish date to the post medieval period. Strumpshaw Hall (NHER 3978) was built in the early part of the 19th century in a Classical style with a prominent Doric porch. As its name suggests, Old Hall in Strumpshaw (NHER 3979) is of greater antiquity having been constructed in 1646 for John Stubbe. This grand residence has extensive outbuildings to the northwest including a kitchen and stables. Sadly, Buckenham Hall (NHER 14054), owned by the Godsalve family, no longer exists after the Cantley Sugar Beet Company demolished it. Other merit worthy buildings include the Old Rectory in Buckenham (NHER 20959) and Oaklands Farmhouse (NHER 45944). The Old Rectory was built in 1827 but was extended in 1839 and is notable for a brick pulpit incorporated into its boundary wall that was used by the Evangelical preacher W. Haslam between 1853-71. Oaklands dates to the 17th century and features a reed-thatched roof and parapeted gables. It is worth noting that two railway lines served the area by the 19th century. The Norwich and Yarmouth line (NHER 13571) ran through Buckenham and the Norfolk Acle Diversion (later Great Eastern) (NHER 13572) line ran through Strumpshaw itself. At present, few post medieval objects have been found in Strumpshaw with a jetton (NHER 35019), pottery sherds (NHER 12446) and an animal bell (NHER 39572) comprising the main artefacts. Two World War Two sites have been identified in the parish. The first is a concrete pillbox that stands on the site of Hill House (NHER 25947) and the other is the site of a searchlight battery (NHER 34527) to the south of the Buckenham Road. The size of the site and number of searchlight emplacements would suggest that this was a Troop headquarters for the passive defence of the area. The most recent archaeological record concerns a Royal Observer Corps underground post (NHER 35404) near the border with Brundall. It opened in 1961 and closed in 1991 but is still largely intact. Thomas Sunley (NLA) 11 July 2007.